Frank Baldwin Jewett was President of Bell Laboratories (1925-1940). Other institutional affiliations included Western Electric Company and American Telephone and Telegraph Company. 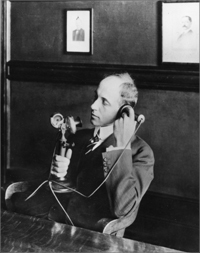 His research interests included the telephone industry and radios. September 5, 1879Birth, Pasadena (Calif.). 1898Obtained AB, Throop Polytechnic Institute (now California Institute of Technology), Pasadena (Calif.). 1902Obtained PhD in Physics, University of Chicago, Chicago (Ill.). 1902 – 1904Instructor in Physics and Electrical Engineering, Massachusetts Institute of Technology (MIT). 1904 – 1912Transmission Engineer, American Telephone and Telegraph Company, New York (N.Y.). 1912 – 1925Assistant Chief Engineer (1912-1916); Chief Engineer (1916-1922); and Vice President (1921-1925), Western Electric Company, New York (N.Y.). 1918Member, National Academy of Sciences. 1919 – 1925Vice-Chair, Engineering Foundation. 1923 – 1927Chair, Division of Engineering and Industrial Research, National Research Council. 1925 – 1940Vice President, Development and Research, American Telephone and Telegraph Company. 1925 – 1944President (1925-1940) and Chair, Board of Directors (1940-1944), Bell Telephone Laboratories, Murray Hill (N.J.). 1933 – 1935Member, United States Science Advisory Board. 1939 – 1947President, National Academy of Sciences. 1940 – 1946Member, National Defense Research Committee, United States Office of Science Research and Development. November 18, 1949Death, Summit (N.J.). Both employed at Western Electric Laboratories and Bell Telephone Laboratories. Transmission Engineer and Vice President, Development and Research. Assistant Chief Engineer; Chief Engineer; and Vice President. Obtained AB (then Throop Polytechnic Institute). Frank Baldwin Jewett papers, 1939-1947. AT&T Archives and History Center records, 1869- present. Oral history interview with Gregory Breit, 1975 December 8. Oral history interview with James Brown Fisk, 1976 June 24. Oral history interview with Russell S. Ohl, 1976 August 19 and 20. Robert A. Millikan papers, 1821-1953. W. Mansfield Clark papers, 1903-1964. Frank B. Jewett Physics Today obituary.